As new development creeps into Little Havana, a master plan is in the works aimed at preserving the historic character and the pre-World War II architecture in Miami’s most famous neighborhood. 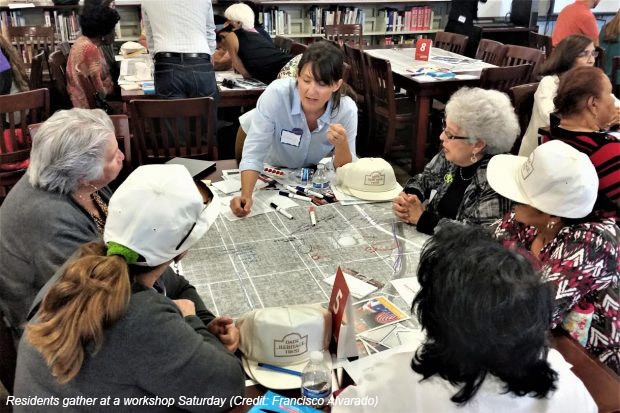 On Saturday morning, more than 100 residents and merchants participated in a community workshop at Miami Senior High School to formulate big picture ideas for the master plan, which is being developed by urban planning firm Plusurbia Design in conjunction with the National Trust for Historic Preservation, Dade Heritage Trust and Live Healthy Little Havana. A majority of the participants reached consensus on restoring and reusing historic buildings, ensuring new construction is contextual and compatible with Little Havana, creating more affordable housing, community and cultural centers and making the neighborhood more pedestrian and bicycle-friendly. More than a year ago, the national trust began efforts to designate Little Havana a national treasure, an honor that was officially bestowed in late January, McLaughlin said. At the time the designation was made, Live Healthy Little Havana awarded grants for the Plusurbia master plan and a streets plan being developed by Urban Health Partnerships. “The grant allows us to look at what zoning could be that is compatible with the existing neighborhood and allows healthy new development,” she said. Little Havana’s proximity to the urban core is making the neighborhood an attractive alternative for investors and developers, many buoyed by Greystar’s $89 million purchase late last year of the InTown apartment complex developed by Astor Companies. Nearby, a company controlled by Ana V. and Pedro O. Rodriguez has been approved to build a 12-story, 96-unit residential building at 45 Southwest Eighth Avenue that will also include 44,525 square feet of commercial space, 311 parking spaces and 15 bicycle parking spaces. During the workshop, PlusUrbia founder and director Juan Mullerat told attendees Little Havana hasn’t experienced the level of real estate development seen in Brickell, Edgewater and Wynwood because of the city’s zoning code, Miami 21.